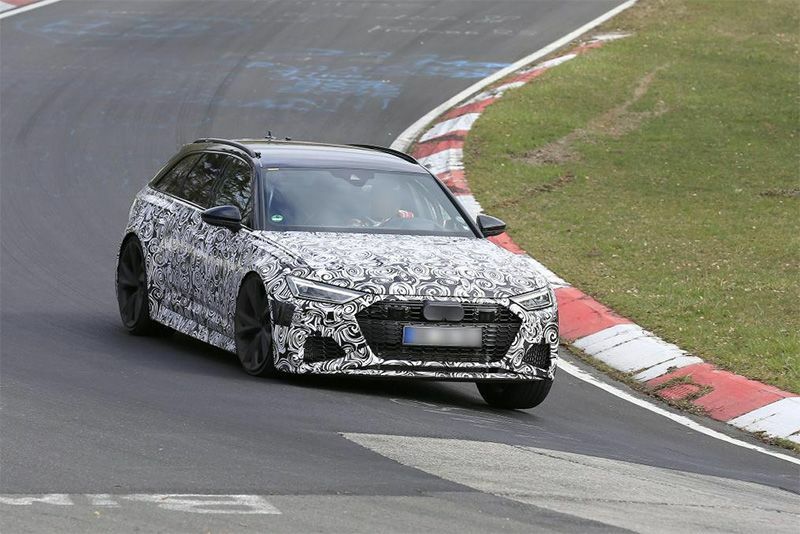 Audi's new RS6, seen testing at the Nürburgring in preparation for its launch later this year, will arrive with a hybrid powertrain pushing close to 700bhp. Station wagons may have fallen out of favour as people drift towards SUVs but there's something to be said for the 700-ish bhp, Audi RS6 Avant. Seen in these spy shots wearing camo, the RS6 looks good blasting around Germany's Nürburgring. The new Audi RS6 is due to be officially launched later this year with a new hybrid powertrain like the next-gen RS7. The estate will go head-to-head with the Porsche Panamera Sport Turismo Turbo S E-Hybrid and the Mercedes-AMG E63 S estate – which should make for some great competition. The Avant may be heavily disguised in these spy shots but the muscular bodywork, huge alloy wheels, big brakes and oversized twin exhausts are clear indicators of its RS designation. There's a new front bumper and headlights too, while its bum looks sharper and more aggressive. Audi says the RS6 Avant will be offered in two versions, Standard and Performance, like its RS7 sibling. The mighty 4.0-litre twin-turbocharged engine from the Lamborghini Urus and Bentley Bentayga will power both derivatives but the Standard model will make around 600bhp and the Performance model 100bhp more. Both versions of the RS6 will get Audi’s dual-clutch automatic gearbox and Quattro all-wheel-drive system but the extra 100bhp of the Performance model is courtesy of hybrid technology, likely from the Porsche Panamera Turbo S E-hybrid. It goes without saying that the RS6 will receive all the standard Audi A6's safety technology, such as autonomous braking (AEB) and lane keep assist. We expect to see HD Matrix LED headlights, their latest infotainment system and a high-end audio system as standard fit too. Prices haven't been released yet but we'd ballpark the Audi RS6 Avant base price at around £100,000 without any options.